I don't know where the time is going it's going so fast and I have been so busy with one thing and another that before I know where I am another week has gone by. There are still many exciting things happening for me since the start of this year and whenever that means I can pass on something to you all then that is what I do. I was given two copies of a new CD by Anice McNamee from Funky Hand ... one to keep and one to give away .... and so the latest "Give Away" is now on. If you haven't been over there lately to see the news then you need to hurry as it is due to end on Saturday 18th May. I have added several videos over the last month and I hope you have enjoyed them and trying out the ideas. 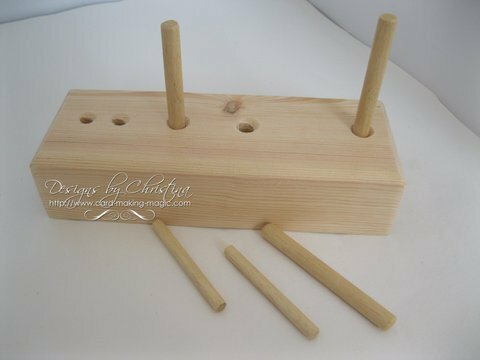 It can help you to create the lovely big Chocolate Box bows that are so popular ... and there are other techniques that can be done with this useful little piece of equipment. I am happy to send this to you wherever you live but because of the cost of postage for this item I am only able to send it outside of Europe via Surface Mail. All that means is that it will take a little longer to get to you. I hope it won't stop you ordering one though as it is well worth the wait. 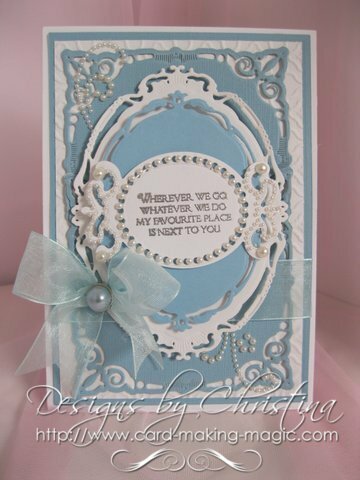 This Hinged Card was another way for you to create some beautiful cards and is an easy style to achieve. for a more spectacular look. Don't worry if you don't have the exact same Spellbinders die that I have. You can get a similar look from any that have a fancy edge to them that you already have in your collection. Please don't forget to pop over to the blog and join the growing list of followers and keep up to date with any future "Give Aways"
You will need to become a regular follower to enter any of the Give Aways. My YouTube views continue to grow and I am well past the 2 million mark. I still continue to get some lovely comments from people all over the world and I thank every body so much for all their support. The numbers for today are 2,144,379 with 8,588 followers. I will answer as many as I can and if I don't know the answer I will surely try to find it out for you.